Review date: 21 July 2001. This is not a big secret. If you drop them, they crack. If you open them when the hinges have got wedged, they break. If you leave them on the dashboard of your car on a sunny day, they scrunch up. This could explain why there are so many alternative, after-market things for putting CDs in. 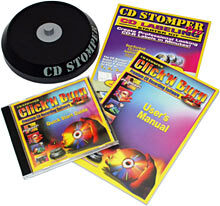 Stomp Inc were good enough to send me their entry into this market - DiscSavers. DiscSavers come in packs of 10 or 50, in rainbow colours or in clear plastic, and I quite like them. More on them in a moment. First, though - why do jewel cases stink? The darn things have been around for a couple of decades now, after all; surely somebody at the factory would have noticed, right? Well, they have. But they're not going to change. See, your ordinary CD jewel case is made out of polystyrene. Not polystyrene foam, like plastic foam cups and packing material and so forth. "Styrofoam", which is a Dow Chemical trademark, is polystyrene foam. No, plain jewel cases are made out of solid, pure, polystyrene. They're made out of solid polystyrene pretty much solely because it's a cheap plastic, and when there's nothing added to it, it's crystal clear. Which jewel cases have to be. Polystyrene is also quite hard, which makes it reasonably scratch resistant. But which also means it's brittle. As you may have noticed. If you want strong CD cases that are still see-through, you've got to make them out of polycarbonate, which is very strong indeed but which makes the cases cost more than polystyrene. 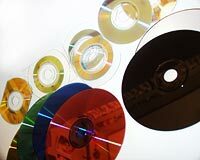 CDs themselves are chiefly made of polycarbonate, which is why they're so extraordinarily mechanically strong. 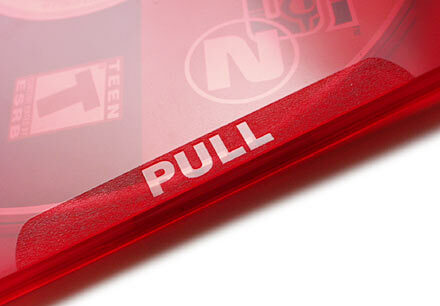 But they have to have strong construction, to protect the super-delicate reflective layer inside. Otherwise, the plastic layer in CDs would probably be polystyrene too. As things stand, we're in the rather ridiculous situation of having CD cases that are much easier to damage than the CDs they're meant to protect. Go figure. If you don't want crystal clarity in your CD cases, you can make them out of something tougher. Which is what Stomp have done, with the DiscSavers. 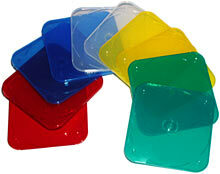 DiscSavers are made out of polypropylene, which is far tougher than polystyrene. ...burns with a distinctive paraffin wax/bitumen smell, and which can be drawn into a thread when molten. Of course I had to set the thing on fire. Back off, man. I'm a scientist. In normal thicknesses, polypropylene doesn't have the amazing bend tolerance of polycarbonate. By way of an experiment, I put a CD I didn't love very much in one of the Stomp cases and then bent the case until I heard a snap - and it was the case, not the CD, that broke. I had to bend it quite a lot to achieve that. Very thin polypropylene, on the other hand, works just fine as a practically indestructible hinge. And that's exactly the sort of hinge that the Stomp cases use. They're all one moulded piece. ...and push on the arrows to either side of the button. To open the case again, you just pull up on the side of the lid. It's a neat piece of plastic fabrication. So I'm excited by simple things. So sue me. The DiscSavers have a slightly smaller footprint than a standard jewel case, and they're only about 4.25mm thick (about a sixth of an inch). "Slimline" jewel cases are a bit more than 5mm thick (about a fifth of an inch), and normal jewel cases are about 10.25mm thick (about four tenths of an inch). You can buy DiscSavers from Stomp directly; a 10 pack like the one I got for review costs $US4.99, and a pack of 50 in their own storage box costs $US19.99, ex shipping. You can get multi-coloured packs, or all-clear ones, for the same price. Shop around and you can get 'em for less; MEI-Micro Center, to pick a random example (well, not that random - they read this review and e-mailed me...), have DiscSavers 50-packs for $US12.97 ex shipping. For comparison, a hundred basic paper CD sleeves (which are hardly an industrial-strength storage solution, but will do for non-critical purposes) will cost you $US29 from CD Sleeves.com. Their prices drop pretty dramatically for larger quantities, but Joe Average isn't likely to care that if he buys 10,000 sleeves he'll get them about five times cheaper. Again, if you shop around you can find them cheaper; paper sleeves can apparently be had for about $US10 for a hundred at various places. Plain clear jewel cases from CD Sleeves.com are $US95 for 200 - or, again, considerably less per unit for larger quantities, or from deeper discounters. Kyric sells ordinary jewel cases for 75 US cents each, for quantities of 49 or less, with prices dropping as the quantity rises. They sell all of the other common kinds of CD holding whatsit as well, and their prices are similar to CD Sleeves.com's. Kyric has tough cases, too, but they cost more per unit than the DiscSavers 50-packs, unless you buy at least 400 of 'em. A reader's pointed out to me, though, that US and Canadian shoppers can get a hundred CD Guard brand tough cases for $US19.99 plus shipping from Shop4Tech. They don't ship outside North America, though. 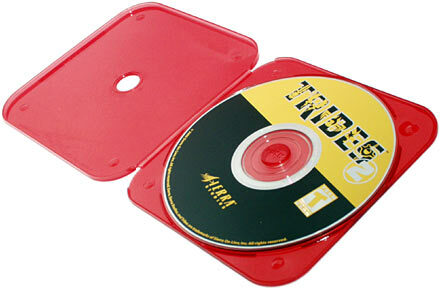 DiscSavers cost more than ordinary jewel cases, but by polypropylene CD box standards, they seem well priced. 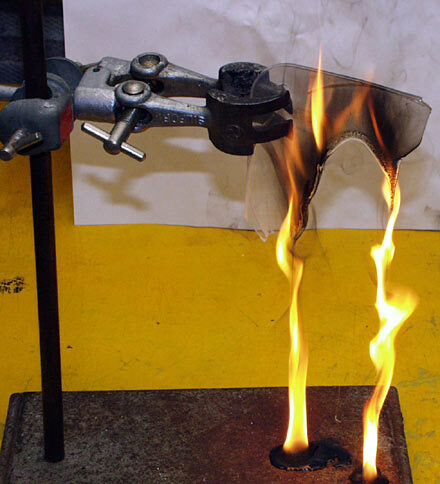 They look nice, they're easy to use, and they burn real good once you get 'em going. What to put in your funky CD cases? How about some peculiar CD-Rs? Stomp also sent me their Click'N Burn Pro CD writing package, about which I wax lyrical in this review of a not-very-good FireWire gadget.